This church is one of those sold off by the Anglican diocese in an ill-conceived attempt to rationalise its resources in the late 1970s. It was bought by the reclusive Sir John Gooch of Benacre Hall, whose ancestors are buried here; but neglect set in, and for many years the church languished in its overgrown graveyard. And then, Sir John died, with the consequent sale of the Hall and its contents, which made the national headlines for raising 10 million pounds. 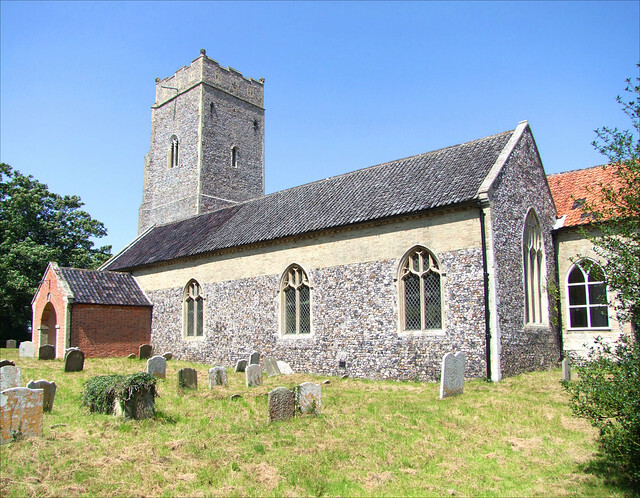 The church was inherited by Sir John's brother, Sir Timothy Gooch of Covehithe. When I first visited, in the autumn of 1998, the churchyard had just been cleared, and it was possible once more to enter the porch. It looked as though someone might be taking care of St Michael again. Coming back in 2011, everything seemed well-cared for, the churchyard trim and the guttering in good order. The only crimp was that it wasn't possible to step inside the church itself. Instead, I wandered around the graveyard, which is small, but there are a couple of good 18th century headstones, and another with a moving inscription to Amy, James and John Bunn, three children aged 3 and under who all died on the same day in 1851. Pevsner visited here in 1959, and found the 18th century Gooch tombs, some nice round-backed box pews, and a surviving squire's pew. As I say, it isn't possible now to see inside - the Gooch family keep it locked as their mausoleum - but you can gaze through the big chancel windows easily enough, and see some of the memorials, as well as a decent east window which must have been installed not long before redundancy. Every Suffolk church has its ghost, I'm sure. But here at Benacre on my first visit, the clearing of the undergrowth had revealed a large wooden board. I turned it over, and discovered, as well as a sizable ecosystem, that it was the church sign, which had stood at the gate, as it does in almost every other Suffolk churchyard. Still attached to rusty drawing pins were the rotten remains of a notice, perhaps even the redundancy order of 20 years before.